The standard aims to help organizations establish the systems and processes to improve their energy performance, including efficiency and consumption. The ISO says the standard is applicable to all types and sizes of organizations. It originated out of a request for an international energy management standard from the United Nations Industrial Development Organization (UNIDO). In 2008 ISO created a project committee, ISO/PC 242, Energy management, to develop the standard. Boundaries - Physical or site limits and/or organizational limits as defined by the organization. Examples include a process, a group of processes, a plant, an entire organization or multiple sites under the control of an organization. CIP - Continuous Improvement Process - An ongoing effort to improve products, services, or processes. Recurring process which results in enhancement of energy performance and the energy management system The process of establishing objectives and finding opportunities for improvement is a continual process. Continual improvement achieves improvements in overall energy performance, consistent with the organization’s energy policy. Correction - Action to eliminate a detected nonconformity. Corrective action - A change implemented to address a weakness identified in a management system. Normally corrective actions are implemented in response to a customer complaint, abnormal levels of internal nonconformity, nonconformities identified during an internal audit or adverse or unstable trends in product and process monitoring such as would be identified by SPC.There can be more than one cause for a nonconformity. Corrective action is taken to prevent recurrence whereas preventive action is taken to prevent occurrence. Energy - For the purpose of this standard, energy refers to the various forms of energy, including renewable, which can be purchased, stored, treated, used in equipment or in a process, or recovered. Energy baseline - Quantitative reference(s) providing a basis for comparison of energy performance. An energy baseline reflects a specified period of time. An energy baseline can be normalized using variables affecting energy use and/or consumption such as production level, degree days (outdoor temperature), etc. Energy baseline is also used for calculation of energy savings, as a reference before and after implementation of energy performance improvement actions. Energy efficiency - Ratio or other quantitative relationship between an output of performance, service, goods or energy, and an input of energy. Examples are conversion efficiency, energy required/energy used, output/input, theoretical energy used to operate/energy used to operate. Both input and output have to be clearly specified in quantity and quality, and be measurable. 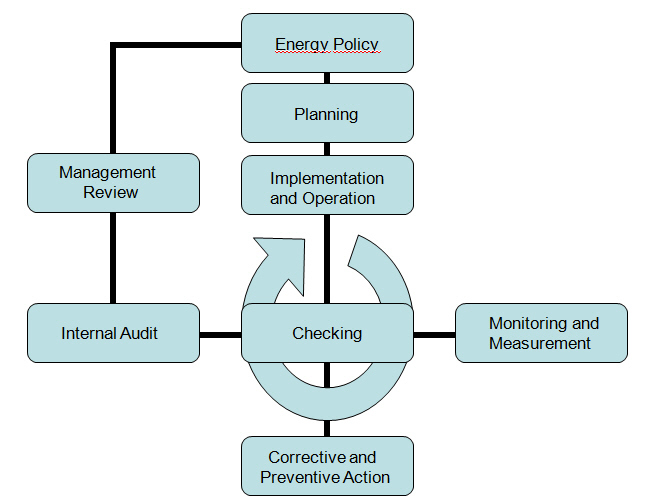 EnMS - Energy management system - Set of interrelated or interacting elements to establish an energy policy and energy objectives, and processes and procedures to achieve those objectives. EMS - Energy Management System - A system of computer-aided tools used by operators of electric utility grids to monitor, control, and optimize the performance of the generation and/or transmission system. The monitor and control functions are known asSCADA; the optimization packages are often referred to as "advanced applications". Energy management team - Person(s) responsible for effective implementation of the energy management system activities and for delivering energy performance improvements. The size and nature of the organization, and available resources, will determine the size of the team. The team may be one person, such as the management representative. 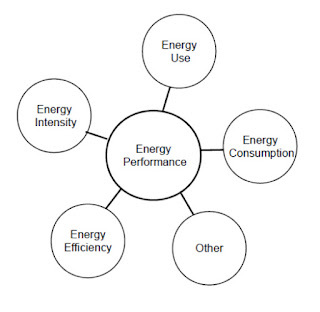 Energy performance - measurable results related to energy efficiency, use and consumption. 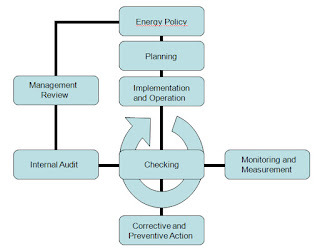 In the context of energy management systems, results can be measured against the organization’s energy policy, objectives, targets and other energy performance requirements. Energy performance is one component of the performance of the energy management system. EnPI - Energy performance indicator - Quantitative value or measure of energy performance as defined by the organization. EnPIs could be expressed as a simple metric, ratio or a more complex model. Energy policy - Statement by the organization of its overall intentions and direction of an organization related to its energy performance as formally expressed by top management. The energy policy provides a framework for action and for the setting of energy objectives and energy targets. Energy review - Determination of the organization’s energy performance based on data and other information leading to identification of opportunities for improvement. In other regional or national standards, concepts such as identification and review of energy aspects or energy profile are included in the concept of energy review. 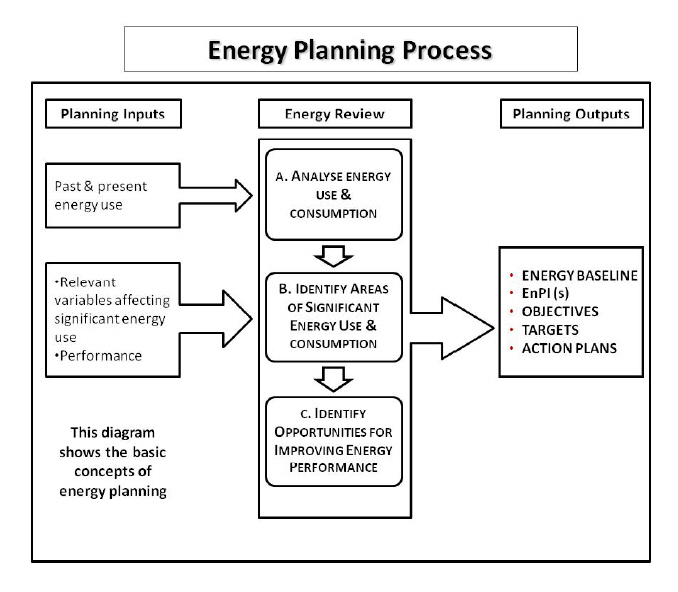 Energy target - Detailed and quantifiable energy performance requirement, applicable to the organization or parts thereof, that arises from the energy objective and that needs to be set and met in order to achieve this objective. Internal audit - Systematic, independent and documented process for obtaining evidence and evaluating it objectively to determine the extent to which requirements are fulfilled. ISO - International Organization for Standardization - Geneva, Switzerland, an international standard-setting body composed of representatives from various national standards organizations. Founded in 1947, the organization promulgates worldwide proprietary, industrial and commercial standards. ISO 9000 - Quality management standards - Designed to help organizations ensure they meet the needs of customers and other stakeholders. Third party certification bodies provide independent confirmation that organizations meet the requirements of ISO 9001. Over a million organizations worldwide are independently certified, making ISO 9001 one of the most widely used management tools in the world today. Similar to ISO 50001 in that both pertain to the process of how a product is produced, rather than to the product itself. ISO 14000 - Environmental management standards - Exist to help organizations (a) minimize how their operations (processes etc.) negatively affect the environment (i.e. cause adverse changes to air, water, or land); (b) comply with applicable laws, regulations, and other environmentally oriented requirements, and (c) continually improve in the above. The ISO 14000 family includes most notably the ISO 14001 standard, which represents the core set of standards used by organizations for designing and implementing an effective environmental management system. Other standards included in this series are ISO 14004, which gives additional guidelines for a good environmental management system, and more specialized standards dealing with specific aspects of environmental management. Similar to ISO 50001 in that both pertain to the process of how a product is produced, rather than to the product itself. Organization - Company, corporation, firm, enterprise, authority or institution, or part or combination thereof, whether incorporated or not, public or private, that has its own functions and administration and that has the authority to control its energy use and consumption. An organization can be a person or group of people. Preventive action - Action to eliminate the cause of a potential nonconformity. There can be more than one cause for a potential nonconformity. Preventive action is taken to prevent occurrence whereas corrective action is taken to prevent recurrence. Procedure - Specified way to carry out an activity or a process Procedures can be documented or not. When a procedure is documented, the term “written procedure” or “documented procedure" is frequently used. Record - Document stating results achieved or providing evidence of activities performed Records can be used, for example, to document traceability and to provide evidence of verification, preventive action and corrective action. Scope - Extent of activities, facilities and decisions which the organization addresses through an EnMS, which can include several boundaries The scope can include the energy related to transport. SDO - Standard Development Organization - Any organization whose primary activities are developing, coordinating, promulgating, revising, amending, reissuing, interpreting, or otherwise producing technical standards that are intended to address the needs of some relatively wide base of affected adopters. Most standards are voluntary in the sense that they are offered for adoption by people or industry without being mandated in law. Some standards become mandatory when they are adopted by regulators as legal requirements in particular domains. Significant energy use - Energy use accounting for substantial energy consumption and/or offering considerable potential for energy performance improvement Significance criteria are determined by the organization. Top management - Person or group of people who directs and controls an organization at the highest level. Top management controls the organization defined within the scope and boundaries of the energy management system. ISO 50001 is designed to help companies make better use of their energy-consuming assets, evaluate and prioritize the implementation of energy-efficient technology, and promote efficiency throughout the supply chain. It is designed to integrate with other management standards, especially ISO 14001 on environmental management and ISO 9001 on quality management. Specifies requirements for establishing, implementing, maintaining and improving an energy management system, whose purpose is to enable an organization to follow a systematic approach in achieving continual improvement of energy performance, including energy efficiency, energy use and consumption. Specifies requirements applicable to energy use and consumption, including measurement, documentation and reporting, design and procurement practices for equipment, systems, processes and personnel that contribute to energy performance. 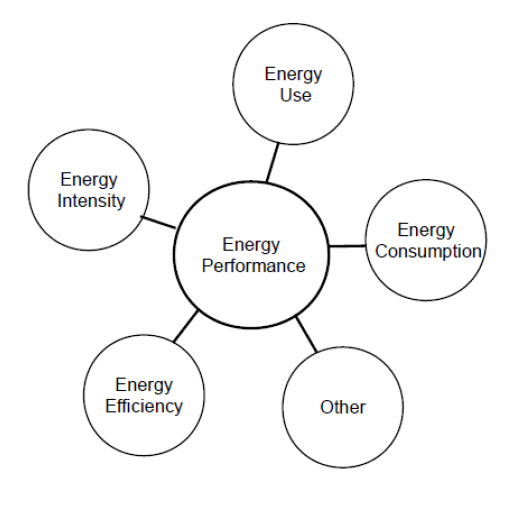 Applies to all variables affecting energy performance that can be monitored and influenced by the organization. Does not prescribe specific performance criteria with respect to energy. Requires participating companies to commit to continual improvements in energy performance. Designed to be used independently, but it can be aligned or integrated with other management systems. Applicable to any organization wishing to ensure that it conforms to its stated energy policy and wishing to demonstrate this to others, such conformity being confirmed either by means of self-evaluation and self-declaration of conformity, or by certification of the energy management system by an external organization. objectives, targets, and action plans. 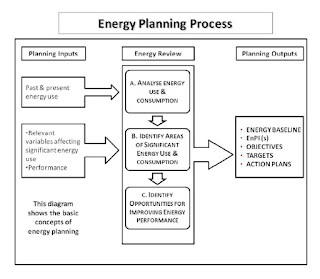 Energy planning shall lead to activities to improve energy performance. 4.4.2 Legal and other requirements - The organization shall identify and have access to the applicable legal and other requirements related to its energy uses. 4.4.3 Energy review The organization shall develop, record, and maintain an energy review. Methodology and criteria used in the energy review shall be documented. The energy review shall be updated at defined intervals and in response to major changes in facilities, equipment, systems, or processes. 4.4.4 Energy baseline - The energy baseline shall be established using the information in the initial energy review. 4.4.5 Energy performance indicators - The organization shall identify EnPIs appropriate for monitoring and measuring energy performance. 4.4.6 Objectives and Action Plans - Establish, implement and maintain documented energy objectives and targets at the relevant functions, levels, processes or facilities within the organization. Must be measurable and include specific timeframes. Shall be consistent with the energy policy. Include financial, operational and business conditions, technological options, and the views of interested parties. Plans for achieving the energy objectives and targets and documents considered by the organization to be necessary for ensuring planning, operation and control. 4.5.3.2 Control of documents - Standard ISO processes for approval, retention and verification of current versions. Shall include a process by which any person working in or on behalf of the organization can make comments or suggest improvements to the EnMS. Decide whether to communicate externally about its energy management system and energy performance, and shall record its decision. 4.5.6 Design - Consider energy performance improvement opportunities in the design of new, modified and renovated facilities, equipment, systems and processes that can have a significant impact on energy performance. The results of the energy performance evaluation shall be incorporated into the specification, design and procurement activities of the relevant project. 4.5.7.1 Procurement of energy services, products and equipment - When procuring energy services, products and equipment that have significant impact on energy use, the organization shall inform suppliers that procurement is partly evaluated on the basis of energy performance. Define criteria to assess energy use over the expected operating lifetime of energy using products, equipment and services (those that have significant effect on energy performance). The organization should include contingency and emergency situations and potential disasters relating to equipment with significant energy use. 4.5.7.2 Procurement of energy supply - The organization shall define energy purchasing specifications as applicable for effective energy performance. The organization shall define and periodically review its measurement needs. 4.6.2 Evaluation of legal/other compliance - Evaluate compliance with legal and other requirements relevant to its energy uses. Conforms to planned arrangements for energy management including the requirements of this International Standard. Is effectively implemented and maintained. Reviewing the effectiveness of the corrective or preventive action taken. Corrective actions and preventive actions shall be appropriate to the magnitude of the actual or potential problems and the energy consequences encountered. 4.7. Management Review - At planned intervals top management shall review the organization’s energy management system to ensure its continuing suitability, adequacy and effectiveness. Interoperability - ISO 50001 is based on the plan-do-check-act approach, as used in ISO 14001 and other management systems standards. - Allow integration with other organizational management systems such as environmental, and health and safety. Executive Leadership - ISO 50001 stresses the involvement of executive leadership, saying that top management must establish, implement and maintain an energy policy. They must identify the scope of the system, communicate its importance, ensure that appropriate targets and performance indicators are established and ensure that results are measured. There are 24 companies working in the pilot mode of ISO 50001, across all types of manufacturing sectors and at all sizes. Between 2008 and 2010, five initial facilities in Texas were piloted, and have been certified to date. The nergy improvements achieved at the facilities ranged from 6.5 percent to 17.1 percent over a three-year period. One of the biggest shifts that the pilot projects found was that as a result of going through ISO 50001 certification, energy management became a way of doing business, instead of a project-by-project undertaking. IPIECA - London - The global oil and gas industry association for environmental and social issues. IPIECA was formed in 1974 following the launch of the United Nations Environment Programme (UNEP). Liaison Organization to ISO TC 242. ISO - International Organization for Standardization - Geneva, Switzerland - An international standard-setting body composed of representatives from various national standards organizations. Founded in 1947, the organization promulgates worldwide proprietary, industrial and commercial standards. OLADE - Latin American Energy Organization - Quito, Ecuador - Created within the context of the international energy crisis of the early seventies, whose scope and impact was analyzed by the Latin America and the Caribbean countries, which lacked energy policies and facing the need to adequately address this crisis began a intense political mobilization process that came to an end on November 2, 1973 with the signing of the Lima Agreement, the constituent instrument of the Organization, ratified by 26 countries in Latin America and the Caribbean. Liaison Organization to ISO TC 242. TC22 - Road Vehicles - All questions of standardization concerning compatibility, interchangeability and safety, with particular reference to terminology and test procedures (including the characteristics of instrumentation) for evaluating the performance of the following types of road vehicles and their equipment. TC117 - Fans - Standardization in the field of fans used for industrial purposes including the ventilation of buildings and mines. TC 207 SC 1 - Environmental Management - Scope: Standardization in the field of environmental management systems and tools in support of sustainable development. Excluded: test methods of pollutants, setting limit values and levels ofenvironmental performance, and standardization of products. UNIDO - United Nations Industrial Development Organization - Vienna, Austria - A specialized agency in the United Nations system, headquartered in Vienna, Austria. The Organization's primary objective is the promotion and acceleration of industrial development in developing countries and countries with economies in transition and the promotion of international industrial cooperation. ISO 50001 evolved out of a request from UNIDO. WEC - World Energy Council - Founded in 1923, the World Energy Council is a global and inclusive forum for thought-leadership and engagement committed to our sustainable energy future. Their network of 93 national committees represents over 3000 member organizations including governments, industry and expert institutions. Their mission is to promote the sustainable supply and use of energy for the greatest benefit of all. Liaison Organization to ISO TC 242.